In the past, the Fleer Legacy brand has set the standard for autographed memorabilia in trading card products. This season Legacy returns, and this time around Fleer is raising the bar by offering authentic autographed game-used baseballs, along with other unique autographed baseballs from MLB legends, stars of today, and even former Presidents! "The Legacy brand is consistently strong and we have now taken the memorabilia concept to the next level with this coming release," said Fleer spokesman Joshua Perlman. "Collectors will definitely appreciate the quality of the autograph line-up and value they will receive per box." Each box of Legacy will contain one (1) of these signed, authentic, limited edition baseballs. Actual game-used baseballs are included in the product and are signed by stars such as Roger Clemens, Mark Prior, Gary Sheffield, Rafael Palmeiro, Scott Rolen, Chipper Jones and more. Phillies first baseman Jim Thome has also signed game-used baseballs used in the "Final Innings Series" played at Veterans Stadium. Look for single signed baseballs from legends of the past such as Ty Cobb, Babe Ruth, Roberto Clemente, Ted Williams, Roy Campanella, Nolan Ryan, George Brett, Stan Musial and many more! Additionally, Fleer has included team signed baseballs from legendary organizations such as the Brooklyn Dodgers, Boston Red Sox, New York Mets, New York Yankees and other celebrated teams. Record and Milestone baseballs are featured as well and include the 500 Home Run Club, 3,000 hit club and 3,000 Strike Out club. As an added bonus to Legacy MLB, Fleer has incorporated Presidential signed baseballs from John F. Kennedy, Ronald Reagan, Richard Nixon, George H. Bush and George W. Bush. Featured in Legacy are different official Major League Baseballs that display official logos commemorating distinctive and historic games or events. 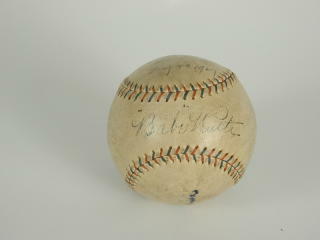 For example, New York Yankee 100th Anniversary baseballs are signed by Yogi Berra, Reggie Jackson, Don Mattingly and more! 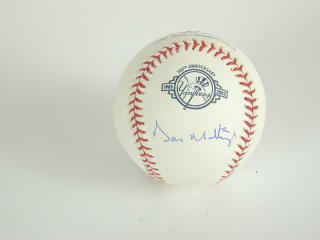 Baseballs marked with the 2004 All-Star Game logo are signed by all-stars such as Randy Johnson, Roger Clemens and Manny Ramirez. 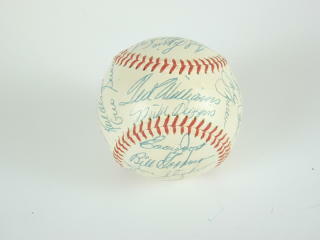 Official MLB baseballs include signatures from Cal Ripken Jr., Vladimir Guerrero, Hideo Nomo and more. 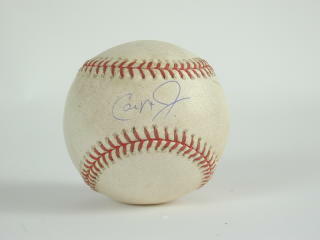 The list keeps going with 2004 Opening Day baseballs with signers that include Vladimir Guerrero, Miguel Cabrera, Chipper Jones and Jim Thome. There are also 2004 Opening Day Japan baseballs signed by Bernie Williams, Gary Sheffield, Mariano Rivera and more stars from those opening games. All of these baseballs are tied-in to a great hobby product that along with the signed memorabilia contain seven (7) cards per one-pack box. Each one-pack box delivers the signed baseball and also one (1) serially numbered single, dual or triple game-worn patch card numbered to 99 or less!